Place of Origin: South East Asia. Typical Tank setup: Plenty of open swimming space with a few bits of bogwood/rocks. Compatibility: Overall their personality can be variable, some peaceful, others truly aggressive, and in the authors opinion they are oversold as suitable for community. Many end up in species tanks with a compatible mate out of necessity, or moved to midsize cichlid communities in larger bodies of water where they represent a less significant danger to other fish. 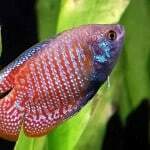 They are often stimulated into aggression by the presence of other gourami species, especially if the other species happen to be breeding. From the outset, it is probably wiser to include them in communities where they are actually one of the smaller species present. Feeding: Herbivore – Feed with vegetable flakes. 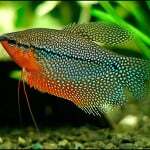 Keep some cheap plants in the tank for the Kissing Gourami to eat. 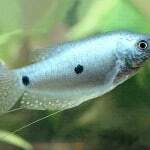 Do not clean the algae off the back and sides of the tank as the Kissing Gourami will eat it for added nourishment. Sexing: Cannot be determined from external features. Breeding: Very difficult to breed because they require large tanks. Condition the two breeders for a couple of weeks with live or frozen brine shrimp and earthworms. Separate the pair for a few days before transferring them to the spawning tank. The tank should be about two-thirds full of water, and have plenty of floating plants. The temperature should be about 82 degrees F, with plenty of surface cover. Establish the breeding tank for a week or so to establish food cultures for fry. 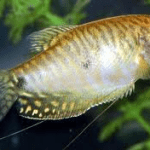 Additional Information: Territorial; This is an aggressive species among gourami’s, especially with their own kind, males may fight persistantly to exhaustion and major jaw damage. Their famed kissing is in actual fact no way cute, or actually kissing, it is a most serious battle of liplocking identical to the fighting practiced by so many cichlids, and over a period of days or weeks , if the combatants are not seperated it can lead the the death if at least one of them. 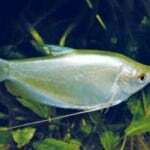 Gouramis with broken or torn jaws will be unable to eat and will consequently die. 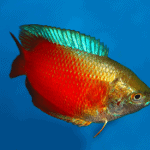 A hyperstimulated male may not limit its aggression to other males, and could disrupt a small community tank by chasing and gnawing on other fish. 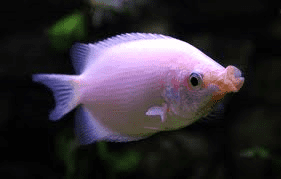 Kissing gouramies are not particularly well equipped to cause bite damage on other species, but their persistant aggression and multiple attemps to attack may cause delicate fish to wane, and stimulate other aggressive species to fight. 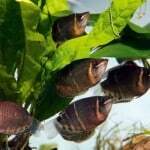 In addition to sexual territoriality and competition , kissing gouramis will also fight to protect a feeding territory. 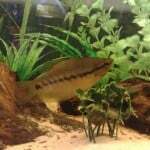 This species is an algae eater and micropredator specialising in aufwuchs, and each specimen may choose to defend as many surfaces as feeding grounds that it can successfully police, and that means an aggressive specimen may wish to victimise other fish within an area of up to three feet. Fish have been on the earth for more than 450 million years.